Wow! You’ve magically swapped places with your puffle! Where will your path lead as you explore the world of Club Penguin from a puffle’s point of view? Will you make some fluffy friends? Will you give your fur a wash? Or will you run away? The choice is yours in this cool Pick Your Path adventure! 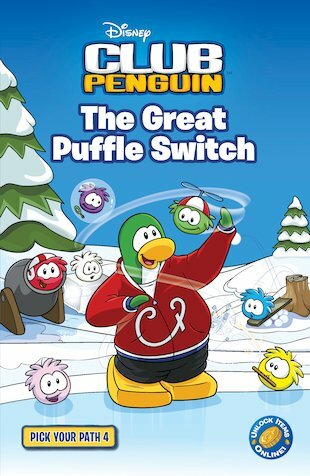 PLUS – go online to unlock fantastic Club Penguin items with the special code in this book. Can you solve this Puffle problem and unscramble the newspaper headlines? I don’t Like Club Penguin anymore. I loved the part where PJ swapped bodies with his owner and the owner said PJ (technicly him) said PJ was a giant penguin!